Unlike last time, I decided to try a few more items. And yes, I ate it all! I started with their Seafood Chowder and arrived piping hot. And I mean really hot! 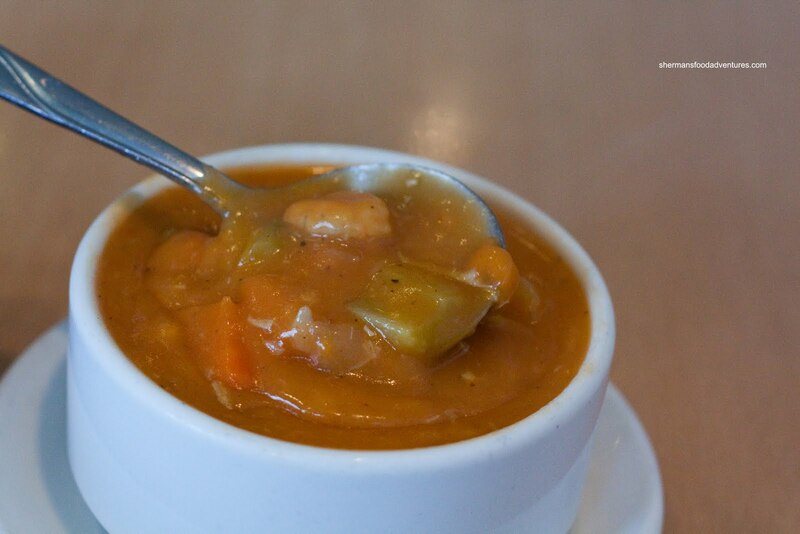 Due to its thickness, the soup retained much of the heat down to the last drop. It was mostly sweet and "floury-tomotoey". There was quite a bit of seafood and veggies in the soup; yet curiously no potatoes. Not sure if could be called a chowder in that case. Despite this, it was a satisfying and hearty soup (not chowder). 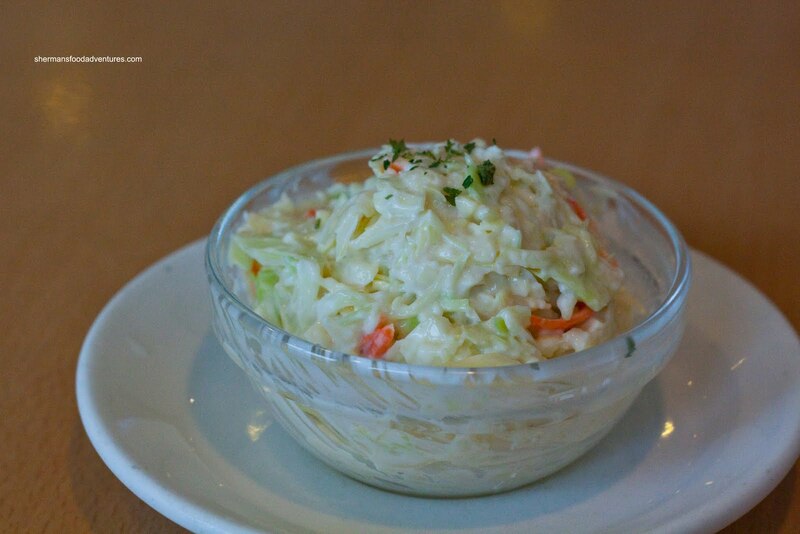 As part of the large meal I ordered, the Coleslaw arrived in a separate bowl. I found it to be quite good with just the right amount of dressing which had a nice tartness. The cabbage and carrots were shredded into a proper size which gave it crunch while still being able to be adequately flavoured. Now as for my Seafood Combo, it included cod, oysters, scallops and sauteed prawns. For what it's worth, the oysters and scallops were good. Nothing to write home about; but they were the right texture, not fishy and fried crispy. With that, it met expectations. The sauteed prawns were slightly greasy; yet again, cooked correctly with nice flavour from the peppers and onions. The star of the plate is still the fish. Just like last time, the piece of cod was thick, moist and just cooked. The batter was not exactly the thinnest; but it was light and crunchy while not being oily. The tartar sauce was not bad, I personally would like more zing. However, I guess that is what the lemon wedge is for. Finally, the meal is so big, the Fries also arrived on a separate plate. 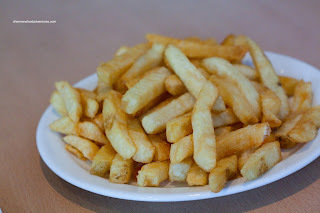 Like the other fried items, the fries were not oily and sufficiently crispy. There was still a nice potatoness on the inside. These were above-average fresh cut fries. In fact, Ocean Ave is probably still one of the places I would put on my list when it comes to fish & chips. The owner-operators are very friendly and it is definitely an honest business. It's not the sexiest choice such as Go Fish or Pajo's; but it is substantially less expensive and good in its own ways. Your review, and a friend's comments, made us go there, way back when. Still love the place, nowhere else has been as good. Thanks! And yes, OA is still one of my faves. Not sure if I agree with your negative! I've tried EVERYTHING on their menu except for Steak and the Prawns Casino pasta and my mouth is watering just thinking about it! My parents and cousin love the seafood pasta. The beef burger, chicken burger, and chicken strips are favorites around my friends. Lots of seniors loved the chowder too! 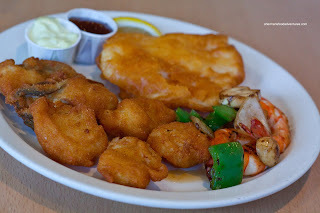 But obviously the main staple here is their fresh and delicious fish n' chips! Nothing beats it! It just reopened this past Tuesday (July 17th, 2012) after closing due to the cook/owner having colon cancer. So excited to have it back!